I have just returned from an extremely interesting exchange visit to one of my university's partner institutions, State University of Malang (Universitas Negeri Malang), in eastern Java, Indonesia. My job there was to lecture and run workshops for staff and students on digital skills development and online collaboration as well as discussing aspects of technology in education with management, teachers and administrators. I must complement my hosts for excellent hospitality and a very warm welcome. It's always fascinating to discuss with colleagues in different countries and finding that although we have different cultures, history, languages and educational context we have so much in common. Higher education all over the world is in the midst of a digitalisation process that is forcing us all to revise our concepts of teaching and learning. This process is never simple nor straightforward, with frequent barriers and backlashes to overcome. Once we start talking, we recognise each other's difficulties and hopefully can learn from each other. Malang State University (MU) was founded in 1954 and has today over 33,000 students based on three campuses around the city of Malang. The city itself, with a population of over 3.5 million in the urban area, is known as a city of education and is home to four public universities and 13 private institutions. The main campus is modern, tidy and very green with tree-lined avenues and parks. 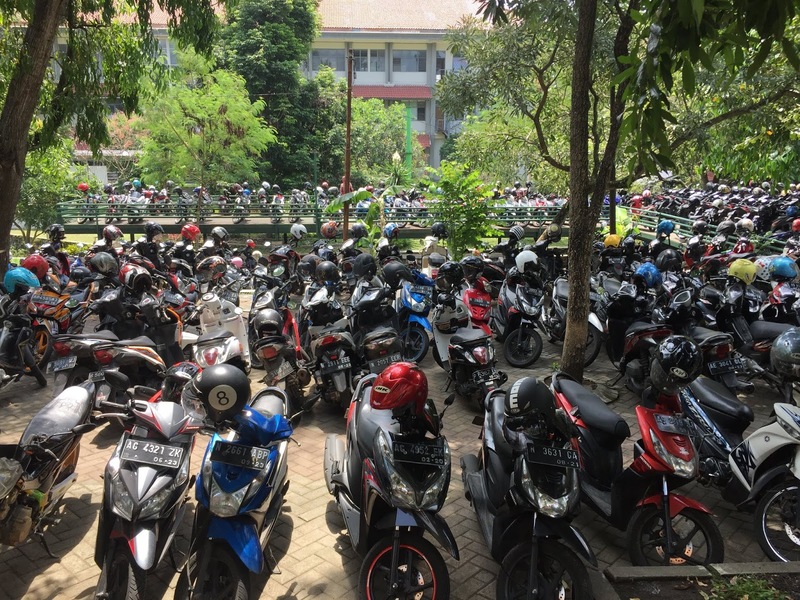 The most striking feature of campus life is that virtually all students have a motorbike (indeed the whole country is swarming with motorbikes) and all the parking areas are packed with bikes. There is no real distance education so all students live on campus and are all in the age group 18-23 since it is extremely difficult to apply for the state universities once you get older due to government regulations. The private universities accept older students but many of them are rather expensive. So here university is still seen in its traditional role as as something you do when you are young in order to get a good job. Professional development for alumni seems to be rather rare and when offered students are expected to attend campus classes. The lifelong learning sector is covered by the Indonesian open university, Universitas Terbuka, with about 460,000 students. Like many other open universities around the world it offers a variety of study options with digital and printed course literature, broadcast TV and radio and a network of support centres in major cities around the country, often in association with other universities. I had no contact with any representatives of this university but in the world's fourth most populous nation (population over 260 million) there is surely room for more institutions in the lifelong learning sector. MU is in the midst of the familiar transition from a fragmented digital learning environment run mostly by enthusiasts to an integrated part of the university's infrastructure. The learning management system (LMS) is an adapted version of Moodle run by the IT department but still only optional for teachers and as a result the uptake is only partial. Those teachers who do use the LMS need more training to use the more interactive features and the next challenge is to build a structure for offering support and professional development. 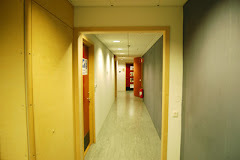 This in turn requires management commitment and a digitalisation strategy covering all of the university's activites. We discussed many options for development including the introduction of educational technologists to support faculty, digitally skilled teachers acting as mentors for colleagues and ways of rewarding those who use digital tools in their teaching. Recognition of those who promote digitalisation, support colleagues and are innovative in their course design is a crucial driver. These issues are under discussion and it will be interesting to follow developments there in the future. Another topic of interest was how to use technology to build bridges between the university's three campuses which, although they are all in the same region, are far enough from each other to limit contacts. Video conferencing is of course an interesting option to build bridges and there was interest in developing this in the near future. Transport between locations (up to 80 km) is not so easy with heavy congestion meaning that journeys of even a few kilometres take up to an hour. As a result the three campuses are largely self-contained. 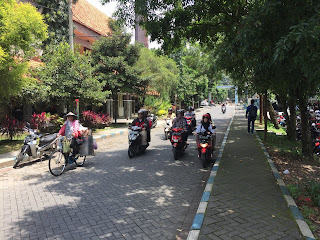 Finally I must add that these are simply my impressions from a one week visit and not an attempt to provide a any overview of Indonesian higher education.